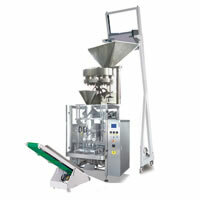 A.	RezPack 4-side sealing bag vertical form fill seal machine provides attractive bags for customers. B. The 4-side sealing bag VFFS machine accomplishes bagging, sealing, date printing, punching, and counting automatically. C.	The film drawing down system is controlled by a servo motor, offering automatic rectifying deviation. D.	The 4-side sealing bag VFFS machine makes use of famous brand PLC and pneumatic system for vertical and horizontal sealing. E.	With low maintenance cost, the 4-side sealing bag vertical packaging machine is easy to operate, and compatible with different internal or external measuring devices. A.	RezPack double tube VFFS machine, high speed vertical packing machine and large type vertical packaging machine provides famous brand PLC control system and wide version touch screen, which is convenient to use. B. 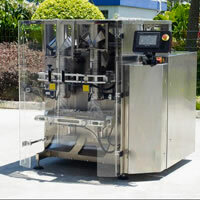 These vertical packaging machines come with film drawing down system and horizontal sealing controlled by servo motor. C.	The alarm system of the packing machine helps reduce waste. D.	Equipped with feeding and measuring devices, the double tube VFFS machine, high speed vertical packing machine and large type automatic vertical packaging machine can complete feeding, measuring, filling, sealing, date printing, charging (exhausting), counting, and finished product delivery, in a continuous flow. 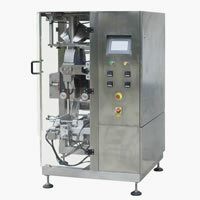 The equipment supports four-side sealing, as well as high speed and multi-lane packing. It offers high working efficiency. B. It is fully automatic due to the design of PLC programmable control system. C. Due to the stepless frequency changer for packaging speed adjustment, the granule packing machine offers more reliable and convenient operation. D. The photoelectric tracking system is adopted to make sure the printed patterns on both sides of the packaging bag are complete. The automatic counting function makes counting precision. E. The machine has automatic batch number printing function, and supports creating of easy-tear notch in longitudinal or transverse direction. 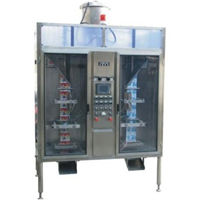 RezPack vertical packaging machine can be used to pack a variety of powder, granule, and tablet products, such as puffed food, shrimp crackers, peanuts, popcorn, cornflakes, fruit jellies, refined sugar, salt, washing powder, and other bar materials. 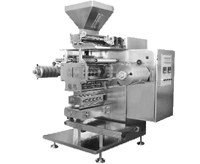 The vertical packaging machine works by feeding materials through a feeder, when the plastic film forms into a cylinder. The cylinder then goes through side sealing by a vertical heat sealer, to hold the materials. After that, the horizontal sealer serves to ensure the packing is cut to the correct length at the right position, with the help of a (color mark) photoelectric detector. 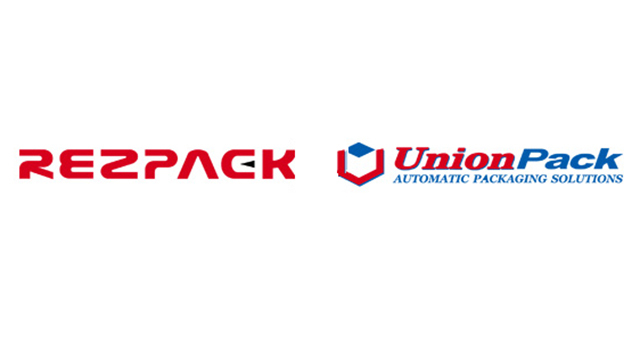 RezPack is an ISO9001 approved, specialized vertical packaging machine manufacturer, located in China. By employing highly experienced technical and management personnel and implementing strict monitoring in line with international standards, RezPack is able to manufacture high quality pre-made pouch packing machinery, pillow type packaging machine, and other products for worldwide customers. Standardized warehousing system helps RezPack effectively reduce enterprise cost, resulting in economical prices of RezPack packaging machinery. 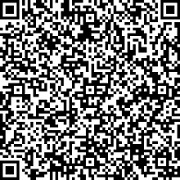 Today, high quality low priced RezPack products are very popular with customers from many countries and regions, including America, Canada, New Zealand and Australia, Mexico, South America, Europe , the Middle East, among others. If you have any questions or concerns, please contact us at RezPack. The staff is happy to help you. Conveyor Equipment The bucket conveyor is used mainly to convey the solid food, such as rice, chip potato, candy, etc.